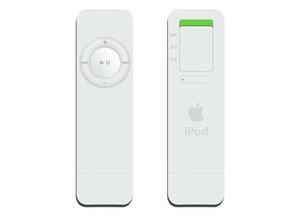 You may wonder why Apple is still selling the iPod shuffle. After all, when you can have an iPhone that runs apps, takes photos, records and plays HD video, and uses GPS to give you directions--or an iPod touch with most of those features--why keep selling a tiny little device that does nothing more than play audio? Because the iPod shuffle plays audio and nothing more. I've owned several iPod shuffles over the years. I bought the initial model, which looked like a white USB stick, back in 2005, when it was first released. The second one, similar to the current model, came into my hands in early 2007, and I still use it, eight years later. I bought a third generation shuffle--the one that looked like a tiny, buttonless sliver of aluminum--but sold it at some point. I often use my iPhone to listen to audio, but I still use the shuffle to listen to music or audiobooks when I walk, either outdoors or on my home treadmill. It's still very popular with people who use it when they're active, and some people use it to have an easy to use music source in their cars. It's dead simple to operate, even with sweaty hands. There's no passcode (or Touch ID) needed; just turn it on, press the center button to play, press again to pause, and use the control ring to change the volume. It's light and unobtrusive, and it clips onto my clothes. You need wired headphones, but I don't worry about audio quality when I'm using the shuffle, especially if I'm listening to audiobooks. I actually like Apple's earbuds: the shuffle comes with the older earbuds, not the more recent EarPods, which fall out of my ears every time I breathe. With the shuffle, I don't need to use my heavier, more complicated Bluetooth headphones, nor worry about whether they're charged. The shuffle doesn't hold a lot of audio, compared to other devices, and it can't stream anything from the cloud. It has only 2GB of flash storage (earlier models held from 512MB to 4GB), but that's enough for more than 15 hours of music (at 256 kbps AAC), enough to have a good variety of music to listen to when running or cycling. (Use a lower bit rate and double that amount.) It can also store a dozen audiobooks. Or a half-dozen Grateful Dead concerts or a dozen Shakespeare plays. There's something satisfying about listening to music or spoken word on a device that is so self-effacing. You clip it on, plug in the earbuds or headphones, and listen. There's no need to worry about network connections, or app updates, and the battery lasts up to 15 hours. And it's nearly unbreakable: I've dropped mine many times, and there's no screen to worry about; you can toss it into a bag and be sure you won't damage it. This minimalist audio player is one of the best iPods Apple has made. I'm glad it's still around; I just ordered a new one.